Tacon, A.G.J. ; Hasan, M.R. 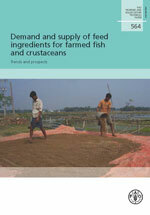 ; Metian, M.
Demand and supply of feed ingredients for farmed fish and crustaceans: trends and prospects.. FAO Fisheries and Aquaculture Technical Paper No. 564. FAO, 2011. 87 pp. The rise into global prominence and rapid growth of finfish and crustacean aquaculture has been due, in part, to the availability and on-farm provision of feed inputs within the major producing countries. More than 46 percent of the total global aquaculture production in 2008 was dependent upon the supply of external feed inputs. For the aquaculture sector to maintain its current average growth rate of 8 to 10 percent per year to 2025, the supply of nutrient and feed inputs will have to grow at a similar rate. This had been readily attainable when the industry was young. It may not be the case anymore as the sector has grown into a major consumer of and competitor for feed resources. This paper reviews the dietary feeding practices employed for the production of the major cultured fed species, the total global production and market availability of the major feed ingredient sources used and the major constraints to feed ingredient usage, and recommends approaches to feed ingredient selection and usage for the major species of cultivated fish and crustacean. Emphasis is placed on the need for major producing countries to maximize the use of locally available feed-grade ingredient sources, and, in particular, to select and use those nutritionally sound and safe feed ingredient sources whose production and growth can keep pace with the 8 to 10 percent annual average annual growth of the fed finfish and crustacean aquaculture sector. The designations employed and the presentation of material in this information product do not imply the expression of any opinion whatsoever on the part of the Food and Agriculture Organization of the United Nations (FAO) concerning the legal or development status of any country, territory, city or area or of its authorities, or concerning the delimitation of its frontiers or boundaries. The mention of specific companies or products of manufacturers, whether or not these have been patented, does not imply that these have been endorsed or recommended by FAO in preference to others of a similar nature that are not mentioned. The views expressed in this information product are those of the author(s) and do not necessarily reflect the views of FAO.